Bryce the Harbor Seal pup was found injured on a beach in Homer, Alaska in August of last year. 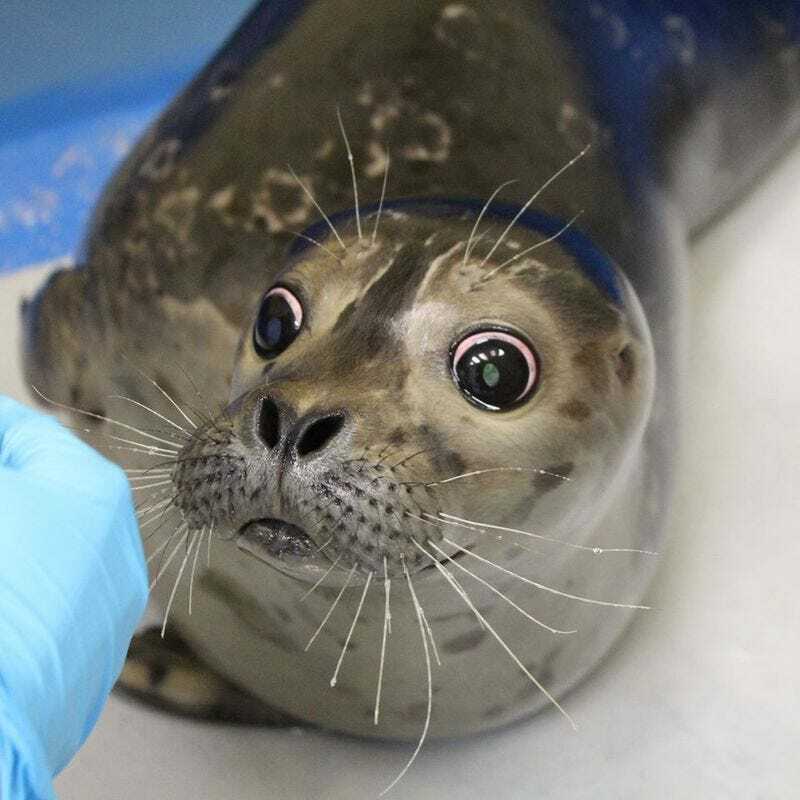 He was rescued by the Alaska SeaLife Center, who found that the trauma that Bryce had experienced caused him to lose his vision. Because of his blindness, Bryce has been deemed "non-releasable" and will spend the rest of his life in captivity. This means that Bryce needs to learn the behaviors that other captive pinnipeds learn, to help them grow accustomed to interacting with humans and participating in veterinary exams. Bryce is learning "targeting," which is a common technique used to teach many different kinds of animals a variety of specific behaviors. Because Bryce is blind, the staff of the Alaska SeaLife Center use rattling shakers instead of the target buoys that are often used with sighted marine animals. When Bryce hears the sound, he can use that sound to navigate, perform the desired behavior and receive a reward. It helps that Bryce has a relatively outgoing personality for a Harbor Seal, which are sometimes skittish and shy in captivity. Despite his lack of sight, he is eager to explore new enclosures and enrichments that his caretakers provide. I've written about Harbor Seals in my Pinnipednesday series. This one is extra-cute. Note the tongue sticking out.